New data shows heavy rain across much of Texas in October significantly improved drought conditions in the state. The U.S. Drought Monitor map released Thursday shows Texas with no areas in the two worst categories of drought — extreme and exceptional. Before heavy rain arrived in October, bringing flooding to some regions, about 16 percent of the state was experiencing extreme drought while another 5 percent was facing exceptional drought. More than 84 percent of the state has no drought while about 28 percent is seeing abnormally dry conditions, which isn't considered a drought category. Minimal drought conditions are concentrated primarily in North and East Texas, with a band extending into Central Texas and southward. 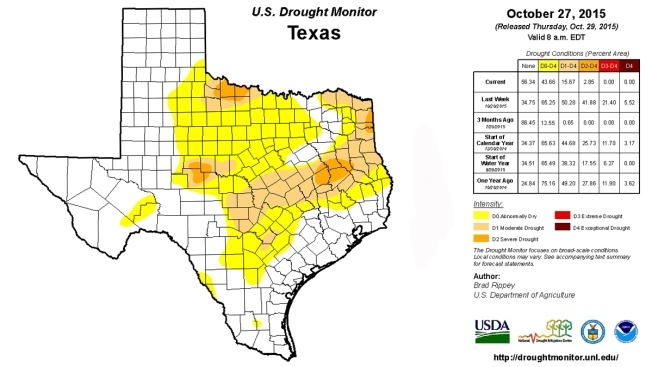 A year ago, about 51 percent Texas was abnormally dry or drought-free.